1. Click File > Setup Wizard. 2. On Setup Wizard - Step 1, click Photo Backup will search for folders. 3. 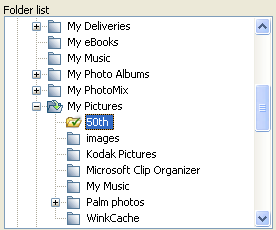 On the Search for Folders with Photos dialog box, click the check boxes next to the drives you want. The search can take a few minutes. 4. After the search completes, the Search Results dialog box presents a list of folders. Click the check boxes next to the folders you want to archive. 5. Setup Wizard - Step 2 displays the selected folders in the Selected folders for backup list. • If you want to select photo folders, you can select more options on Setup Wizard - Step 2. 6. Click the Finish button. The photos in the selected folders appear in the main window. You are now ready to start the backup process. 2. On Setup Wizard - Step 1, click Let me choose photo folders. 3. Setup Wizard - Step 2 displays a directory tree in Folders List. Select a folder with photos in the Folders List. 4. Click Back up with sub-folders or Back up without sub-folders. This adds the folder to the Selected folders for backup list. 5. Click the Finish button. The photos in the folders that you selected appear in the main window. You are now ready to start the backup process. • The Setup Wizard adds folders and sub-folders to the archive by default. If you do not want to do this, click a row in the Selected folders for backup list. And then click Back up with sub-folders or Back up without sub-folders. • To remove a folder from the Selected folders for backup list, click a row in the list and select Do not back up. 1. Click File > New Archive. 2. To add photos, click File > Setup Wizard.